A beautiful, hand-written thank you letter from one of our customers. Thank you Benette for such a heartfelt, personal way of communication – very rare these days. I would like to extend a very big THANK YOU to you as a long-standing sponsor of The Herald Bride & Groom, for supporting us again this year. The gala function was a success, and it’s only thanks to partners like you that make this event one to remember. Francarlo Designer Goldsmith sets the standard for jewellery craftsmanship and outstanding customer service. After painstakingly looking at numerous other jewellers in South Africa and oversees I decided to place my trust in Francarlo to design and build an engagement ring for my wife. The entire process was an absolute pleasure and I am so forever thankful that I chose Francarlo to carry out the work. You will not find a more caring, knowledgeable, experienced jeweller to take care of your jewellery needs and the most important moments of your life. Gifts, christenings, engagements, weddings, birthdays – whatever the occasion Francarlo and Tanya will take the time to understand your needs and find the perfect solution for you within your budget that will truly exceed all of your expectations and make the entire process of buying any piece of jewellery one you will remember with the fondest of memories. Congratulations to what I consider the best jeweller in the world. I would hereby like to thank you for the absolutely beautiful watch I received from your company as one of the prizes I received in the Readers’ Competition of the Herald 2014 Bride and Groom Competition of the Year. I only submitted ONE entry, so you can imagine how thrilled I was to receive the phone call to inform me that Friday the 13th, really is my lucky day. ( My birthday is on the 13th)! At my age, the watch makes me feel really young again! My father and I would just like to say thank you again for all your effort, for the making of the ring and for making this all possible. 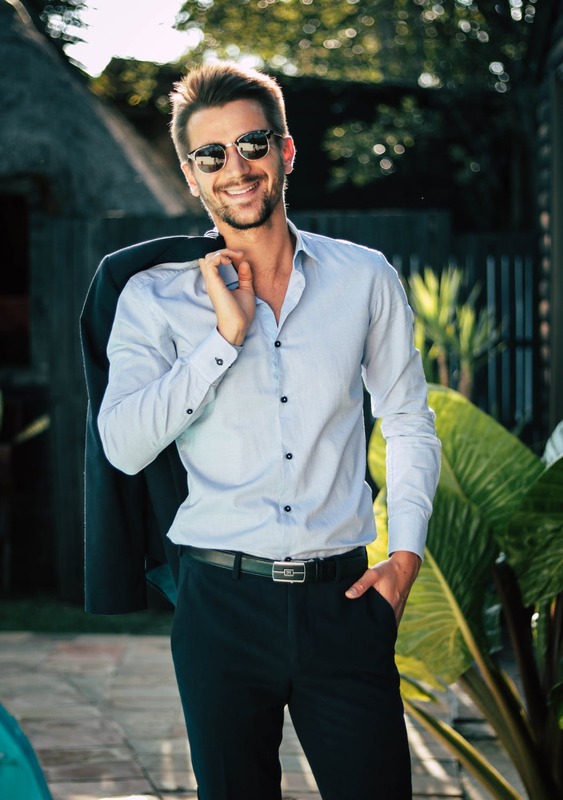 You made it such an easy process for us to go through (just e-mailing through an image and correspondence via e-mail) because of the absolute unwavering confidence we have in you and your stunning work. The ring is absolutely stunning, more than we could have ever imagined. My mother is going to be SO surprised and without a doubt she is going to absolutely love it! Thanks again for making this all possible and for contributing to making my parents 30 year anniversary (6th October) very special. Just a short Email to let you know how pleased I was to receive the two completed mascots for my whitemetal model Rolls Royces the other day. It is obvious to me that you took great care and time to research the subject and then went to work to carve them from that stick of silver you showed me in order to get them as accurate as possible. I can assure you that your personal effort is much appreciated and will be for years to come. Every time I look at my display cabinet I will think of your efforts. I have taken the liberty to enclose a close-up photo of the vehicles in question. It took a lot of hard work, many grueling hours, countless emails, endless phone calls and twelve wonderful celebrities, but we managed to put together one very successful weekend. We would hereby just like to thank you our loyal supporters that contributed to the success of the Missionvale Water 4 Life Charity Drive. Without people like you to rely on, whether your support be small or large, in the form of monetary, emotional or physical, we would not have been able to achieve anywhere near what we had set our hearts on. Thank you to each of our suppliers, no matter the size of your contribution, please know that we value each and every one of you and hope that we can support you with our next charity initiative. Not only have we made great inroads to our target, but we raised awareness on this issue, something which cannot be measured in terms of a rand value. This has also gone a long way to further cementing the fact that the Radisson Blu Hotel Port Elizabeth and its suppliers, believes in giving back to their community. Thank you again for your support, assistance and helping hands. I am the happiest woman in the world sitting here at my desk! I am getting very little work done as I am just staring at my ring! I just want to thank you so much for making my dreams come true! The ring is so more beautiful than I ever imagined. It is perfect! Thanks also for your personal-touch during this time. It really seemed as if you care so much about us and the ring and just wanted what was best! Thank you for the opportunity you have given me to do my work shadowing in your business. The 3 days I worked in your business was short, but it gave me a great insight into the jewellery design industry and the role of the staff in dealing with customers. Shadowing the staff has shown me how important it is to have a good professional relationship with the customers. I would like to especially thank Braemore and Leslie for teaching and showing me the technique of jewellery design and the manufacturing of the jewellery. Thank you once again; I had an amazing and fun experience. We wanted to say a special thank you to you for helping us with our jewellery needs leading up to our wedding last year. The countless hours you spent with us via email or in person, and the time spent designing Anchen’s masterpiece of a ring is so appreciated. Still to this day we get compliments from everyone in regards to Anchen’s ring and what beautiful workmanship has gone into it. We are so honoured that you were part of our day by designing the ring and making the process of buying a ring so easy and special for us. We will continue to recommend you to everyone and we look forward to seeing you again when we are in SA. Recently, Tanya and Francarlo hosted two schoolgirls for a day to show them the ropes with regards to jewellery design. A great day was had by all! I just wanted to thank you for the most stunning rings you did for me. My diamond ring was beyond my wildest expectations and I love it. Thank you too for the “purple number” that gave you so much stress… I really appreciate all you did for me. I had to write a special letter of thanks for the beautiful cross you made for my broche. I am thrilled with it and look forward to wearing it. I can see it was made with the love and dedication of a jeweller. Thanks again – much appreciated. I would hereby like to thank you for your great service during my guests visit to FRANCARLO. My guest is very happy with the purchase and really loves it. We look forward to our next Francarlo visit. Thank you all for all your hard work and for provinding me with beautiful jewellery in my year of reign. I’d like to wish all of you good health, wisdom, joy and peace in 2010 and may this year be a good year for yourselves and yourloved ones. Best wishes and rich blessings. Thank you for the beautiful engagement and wedding rings that you designed and crafted for us. It was certainly special to procure our family “heirlooms” to be from home. My rings certainly attract many compliments. I will treasure them! We also very much appreciated your flexibilty with arrangements from afar. At our pre-sale exclusive client evening, Mrs Spearpoint was the lucky draw winner for a his and hers special prize. 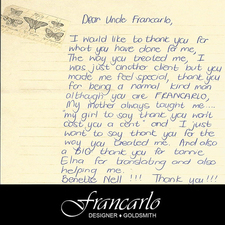 She was kind enough to express her thanks in a letter to the Francarlo team. How do I say “thank you” adequately, for inviting me to your beautifully crafted and designed Spanish display of very lovely jewellery last evening. What a gala evening it turned out to be. To have won your draw was overwhelming, the prettily packaged watch and bracelet was slowly opened with breathless anticipation, AND, the watch is goregous, I shall wear it every day. How delighted Shelleys husband, Donald, was to be offered the bracelet which was such a super “masculine” gift for such a big man. He was delighted when I put it on his wrist. Again, may thanks for a wonderful evening. The Francarlo team where delighted to receive this card of thanks from happy customers Brent and Avril Mundell. It is always wonderful to receive compliments from customers as at Francarlo we strive for impeccable service and a memorable shopping experience. If there is one thing that my husband Gary has taught me …its about good taste in quality jewellery. And it is for this very reason, that we have supported Francarlo Designer Goldsmith for the past 12 years. I remember meeting Francarlo many years ago to discussmy engagement ring … I was in a quandary as to what design to go for … as I wanted something unique. To ease my mind, he mentioned that women often “changed” their engagement ring after 5+ years- wanting something “fresh / new”. 12 years later I still absolutely LOVE my original ring – a testament to his design!!! I have exquisite pieces that I proudly wear on a daily basis (I don’t believe in hiding the “good stuff” in the safe) and am often complimented on my rings, earrings, watch and necklaces … every single piece bought at Francarlo. Thank you Francarlo … I would highly recommend you to anyone who believes that quality jewellery is an investment … because after all, “diamonds are a girl’s best friend”! The South African Council of Shopping Centres introduced the Special Star Awards to each region of South African in 2006. These awards honour those Retailers who deliver an exceptional level of customer service and contribute to the South African Shopping Centre Industry. Customer service is a significant part of the shopping experience and an integral part of what makes a successful shopping trip. Besides customer service, the retailers get judged by an independent panel on inter alia: Merchandising, Window display, Lighting, Staff appearance, Store design, Overall shopping experience etc. Francarlo Jewellers was voted the overall winner for not only the Eastern Cape region, but went on to win the National Retailer of the Year Award which was held at a glittering event at Emperors Palace in Gauteng on 15thOctober 2008. This accolade substantiates that Francarlo Jewellers provides an exceptional level of customer service as well as high standards in the above-mentioned criteria. On behalf of the South African Council of Shopping Centre of the Eastern Cape, we warmly congratulate Francarlo Jewellers on winning this prestigious award. They can be justly proud of this feat and have certainly made the Walmer Park Shopping Centre and, in fact, the whole of Port Elizabeth, proud! Congratulations on an outstanding achievement. As my sponsors, I received a voucher to go and choose whatever Jewellery I desire. When I went in to claim my prize, I was very happy with the level of service that I was given. Everyone including Mr. Francarlo himself welcomed me with smiles and open arms. When I went in he was busy helping another customer and I was stunned. In some businesses the owners are always in their offices, behind their desks and could not be bothered about what goes on in the floor. Not so at Francarlo!! That really impressed me. When a girl goes shopping for jewellery its never an easy task. We make up our minds about 5 times before we make the final decisions. But I fully understand the concept behind all of that – who gets to choose any jewels they want at Francarlo’s and knows first time what they want (especially when DIAMONDS are in the equation). I really had a wonderful shopping experience when I went to chose my prize…so much that my next big item of jewellery for when that “Big Day” comes will defenitely be purchased at Francarlo’s. I would like to Thank Mr. Francarlo and his staff for making my shopping experience there wonderful! I had to email you and thank you for helping design the most beautiful ring I have ever seen in my life! THANK-YOU! THANK-YOU! THANK-YOU! Every single girl that looks at it “oohs and aahs” and gushes at how impressive it is and then they drag me to their boyfriends who look on it in fear 🙂 The design is so elaborate and the diamonds really are the most beautiful and “sparkly” I have seen. It is really beautiful and special that Dem could design it with someone as remarkebly talented as you and your family are. So thank-you from my heart, I will treasure it and continue staring at it in awe for many years to come.